We thought it would all be plastic in the future, that generations to come would never know what it would feel like to hold real gold or diamonds. The craze of bling would be all but lost. However if these latest developments are anything to go by, then the future may just be worth living in. 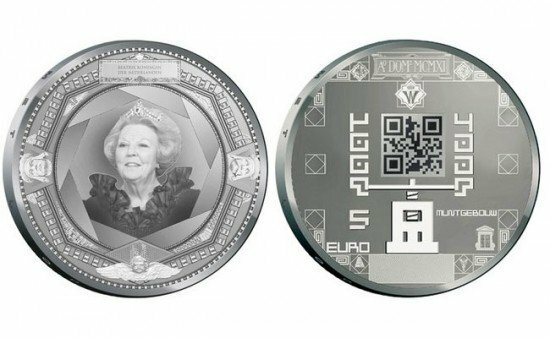 The Royal Dutch Mint has produced what is the first QR coded coin to celebrate the 100th anniversary of the mint in Utrecht. For those who know not about QR code , read up on Wikipedia here – its a brilliant technology that is definitely going to change the world we live in. A lot of you may already have had a brush with it without knowing. I wonder if it is possible to use QR codes to prevent currency frauds? That would be quite something. If not that, the founding fathers may soon be sharing space on coins and currency notes with QR codes of sponsors who have paid for the printing of the currency. Its a great spot to have an advertisement for sure. One thing is for sure, no one knows what the future really holds. But it does seem to be an exciting place from what we can prophesise.